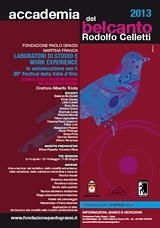 The ‘Accademia del Belcanto “Rodolfo Celletti”’ in Martina Franca is promoted and organised by the ‘Fondazione Paolo Grassi’, in collaboration with the Festival della Valle d'Itria. It was set up in 2010 to provide young lyrical singers with a highly specific training on the various aspects of vocal technique and performance of the Italian Belcanto repertoire (from Monteverdi to proto-Romanticism), comprising of analysis and practice of the various styles of Western musical theatre, including many expressions of modernity. The course also includes various practical workshops, applied to specific Belcanto techniques and aesthetics: from seventeenth-century recitar cantando to expressions of the Apulian and Neapolitan school; from coloratura techniques to variations in early nineteenth-century Italian Belcanto tradition. During the 2013 edition of the Festival della Valle d’Itria, students will have the opportunity of gaining specific practical experience, thus enriching their training. They will be guided by great supervisors, prominent interpreters and concert-masters. Particular importance will also be given to physical and acting training, and to correct, accurate Italian diction – necessary characteristics for today’s ‘acting singers’ engaged in conveying the essential theatrical dimension of opera. Starting from 2013, the Academy’s academic scheme also includes a section specialising in an in-depth analysis of Baroque Belcanto, with prestigious master-classes and valuable one-to-one lessons for young performers with a particular interest in, and inclination towards, this kind of repertoire. This specific, personalised course is enriched with opportunities for practical work experiences during the 2013 edition of the Festival. • the third session (from 7th to 29th June 2013) will be dedicated to specific study. A selection of students identified as suited for the position will engage in a phase of practical work-experience within the 39th edition of the Festival della Valle d’Itria (www.festivaldellavalleditria.it). The course for the academic year 2013 includes the following subjects: Art and technique of the recitative; Art and technique of seventeenth-century vocality; Art and technique of Belcanto coloratura; Art and technique of Baroque coloratura; Art and technique of variation; Verification of vocal techniques; Phonetics and diction; Study of sheet music; Awareness of breathing dynamics; Culture and profession of the operatic singer; Body training; Acting and performance technique; Stage presence/improvisation; Role analysis; Style applications: from Baroque to contemporary music vocality; Workshop: singing, performing practice, study of sheet music, acting; Performance master-class; Belcanto style master-class. - € 500,00 (five hundred/00) for the 3rd session (June 2013). - € 80,00 (eighty/00) for the 2nd session (May 2013). - € 150,00 (one hundred and fifty/00) for the 3rd session (June 2013).